A mom, working out of a small Buffalo, New York, tavern she owned with her husband, single handedly created a market in the U.S. for what was then an overlooked piece of the chicken: the wing. Attempting to satisfy the appetite of her college-age son and his buddies late one night at the family’s Anchor Bar, Teressa Bellissimo remembered the box of chicken wings her meat salesman had given her—yes, they were free—for making stock. She deep-fried the wings, then doused them with butter and hot sauce before serving them with celery sticks and blue cheese dressing. And a star was born. 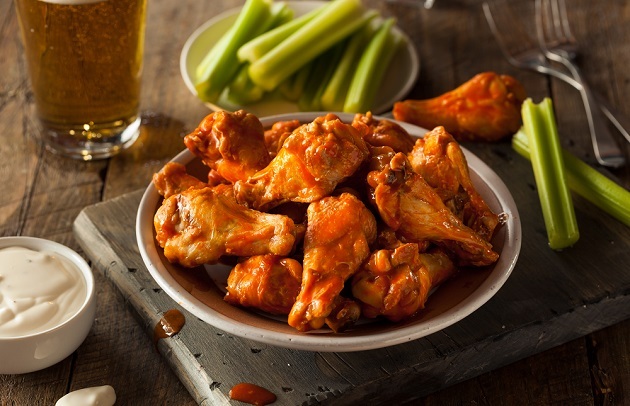 Just in time for tailgating season, I’m pleased to share with you several of my favorite wing recipes as well as tips for making a good thing even better. • Turn the wings into mini-drumsticks to make them even easier to eat. On the larger section scrape the meat down half the bone into a ball at the opposite end. On the smaller section, which has two bones, cut off one cartilaginous end and pull out the slender bone. Then scrape the meat down the remaining bone into a ball at the end. • Grill the wings Asian-style—stretched out lengthwise and impaled on 12-inch bamboo skewers to maximize their exposure to the smoke and fire. (Soak the skewers in beer or sake first, then drain, for extra flavor.) This technique works best with larger wings. • Apply wing sauce at the end of the cooking time or toss the wings in the sauce after removing them from the grill grate. Especially if said sauce contains sugar. It will burn if applied too early. • Dress up the blue cheese dip by using a pedigreed blue cheese, like French Roquefort (made from sheep’s milk), Italian Gorgonzola (a creamy cow’s milk cheese), or Spanish Cabrales (made from goat’s milk). To make a simple blue cheese dip, combine 4 ounces crumbled blue cheese, 1 cup each mayonnaise and sour cream, 1/4 cup minced onion, salt (you won’t need much because the cheese is salty), and freshly ground black pepper to taste. • Save money. Buy whole wings and break them down yourself. Lay each wing flat on a cutting board, then slice through the two knobby cartilaginous joints with a chef’s knife or cleaver. Reserve the “drumette” (it will look like a miniature chicken leg) and “flat” and either discard the wing tips or freeze them for stock. • Avoid charring, flare-ups, and singed arms, by setting up your grill for indirect grilling. Arrange the wings skin-side up on the grate over the drip pan. (Be sure to first brush and oil the grill grate well as wings have a tendency to stick.) Figure on 30 to 40 minutes of grilling time. • Dress up the celery sticks by grilling or pickling them. • Get a smokier flavor, by tossing 1-1/2 cups soaked, drained hickory or other hardwood chips on the coals or placing in the smoker box of your gas grill. Avoid the “guy syndrome” (if some is good, more is better). Some smoke is good, but too much smoke is, well, too much. • Test for doneness by making a small slit with a sharp knife in the thickest part of the wing meat. There should be no trace of pink at the bone—that is, unless you have smoked the chicken wings. Then you will see a reddish smoke ring just under the skin. • Avoid rubbery skin. I prefer indirect grilling at a moderate temperature (350 degrees) over smoking “low and slow” (at 250 degrees). The reason is simple. Indirect grilling crisps the skin; smoking at low temperatures makes it rubbery.